Body Beast Results: Ogden Lost 48 Pounds and Won $500! Ogden Anzueto lost 48 lbs. in 111 days with Body Beast and the Beachbody Performance supplements. He entered his results into the Beachbody Challenge, and won the $500 Daily Prize for November 4th! Before I started the Body Beast program, I felt disgusted with how much weight I had allowed myself to gain. I started to fall into the routine of hardly ever going out because of how uncomfortable I felt with my body on a daily basis. Even when I did go out to even go grocery shopping, I wore baggy clothes to try and hide what was underneath. I wanted to do something about it, but I did not know where to start. I would have to say that my mother’s transformation was what motivated me and convinced me that I, too, could have the body that I have always wanted. My mother had been a Beachbody Coach for almost a year, and that is why I came to her for help when I finally got myself motivated enough to do something about my body. She showed me what it was all about and even did the Beachbody program with me to get me started and on the right track. From the short amount of time I was home, I learned many things about being fit, and since then, I have been practicing these good habits on a daily basis. The biggest challenge that I faced before beginning any Beachbody program was actually staying consistent for a long period of time. I would always work out for maybe a month or so and then completely stop for months to come. I fell into this cycle for many years, and even became convinced that this was a good way to live — get fat for a couple of months, then lose a couple of pounds, and repeat the process all over again. Little did I know that I could be eating all the delicious foods that I always eat, while being in shape at the same time. 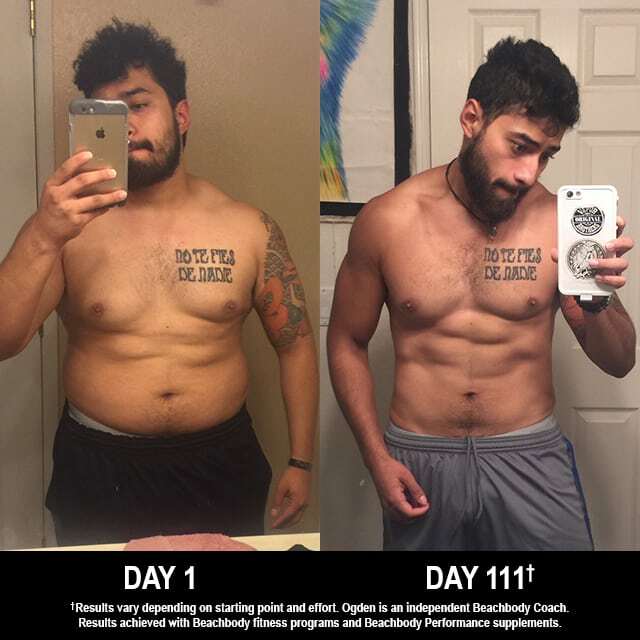 Beachbody helped me not only get in shape, but it has helped me stay in shape because of the huge community that is involved in keeping us motivated and engaged in our progress with our peers. Because of the Challenge Groups, and things of that nature that Beachbody provides for us, I have been able to stay consistent for the longest period of time ever in my life, and every day that passes, I get better and stronger. The journey has become endless. I have always wanted to be a lean and strong-looking guy. When I would work out on my own to achieve these goals, I never got anywhere. I did not know anything about what it took to have a good-looking body. The Body Beast program that I chose to do helped me learn so many things about lifting weights, and most importantly, it taught me how to do it safely. Through Body Beast, every two weeks that pass, I go up in weight in almost all exercises and it still has not stopped. The strength that I am gaining with this program really has me surprised. Through Body Beast, I can finally say that I have achieved my goal physique that I have wanted for so many years. I lost almost all the extra body fat that I had. I gained quite a bit of muscle, and all my lifts like barbell bench press, dead lifts, and squats all went up by a lot. My overall endurance went through the roof while going through these Body Beast workouts. I can say that I am now a very athletic person due to the Body Beast workouts, because they did not solely focus on weight training. My life has changed because I no longer need the program itself, or to read cookbooks and follow diets, or anything of that sort. Beachbody has shown me how to work out, what to eat, what not to eat, and the proper times for certain foods. All of this information is stored in my brain now, and is accessed on a daily basis. It has become a habit so great that I cannot go a day without going to the gym or eating healthy. I just cannot. I can truly say that this habit will carry on with me for the rest of my life. Participating in these Challenge Groups seemed a little silly to me at the beginning. I stayed away from posting anything of me, because of how uncomfortable I was. But with time I realized that all these people were in these groups trying to do the exact same thing I was, which was to achieve a better version of ourselves. The Challenge Groups helped me stay engaged and motivated because as time went by, it kind of turned into an obligation to post in the group. At times I would not feel right if I had not made a post yet. It helps us stay accountable for our workouts, and that is why it works — because of accountability. My Beachbody Coach is my mother, which made this process even harder, because she would not let me quit any of the workouts. No matter how many reps I had left, I was forced to finish them out. This taught me that I needed discipline to push through the pain if I truly wanted to accomplish the body of my dreams. She stuck with me through the entire process, and even when I went away, she still kept up with me to see how I was doing with my workouts and everything else, which helped me stay even more accountable. The Beachbody supplements that I used were the Recover and the Recharge. Every time I got done with a workout, I made sure that I drank my Recovery shake, and every night before bed, my Recharge. At first I did not see much help from these supplements in any of my workouts, but as time progressed further, I became more aware that my lifts were going up incredibly faster than before. I was and still am able to see strength increases every other week. The Recharge shake made me wake up without feeling so hungry, as I would always be before.2 Since I was not as hungry, I always ate light yet hearty breakfasts, and through the night I would not wake up feeling hungry or anything of that sort. I believe that my overall healthiness and these supplements have helped my mood and mental clarity so much. I can, for some reason, learn things at a much more effective rate than I used to.2 I can tell this through all my college courses.